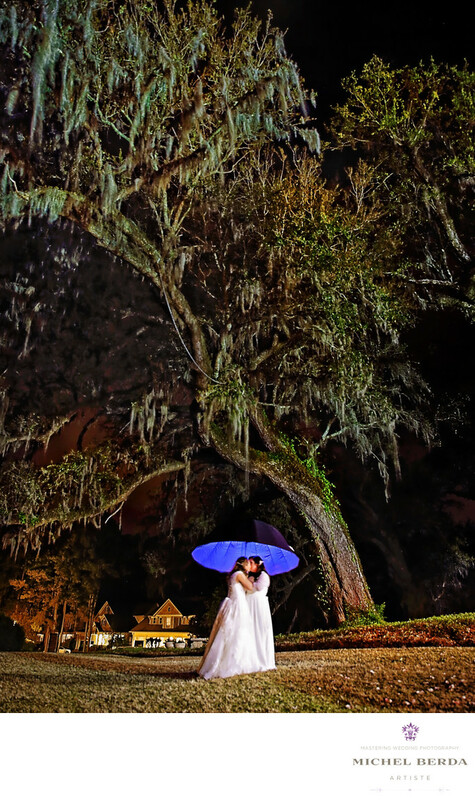 Nested in Summerville, South Carolina you will find this lovely quaint wedding venue called Legend Oaks Golf & Tennis Club. on the drive, you will find the 300 year old live grand oak trees, just spectacular, an array of beautiful Azaleas, & then arriving at the beautiful Clubhouse with another spectacular setting on the 18 hole. The ceremony is generally in front of one of the largest oak trees they have on the property. Making your wedding day a very chic Lowcountry wedding affair. ..I love this wedding venue for so many reasons. One of the greatest parts of being an image maker is creating compelling wedding images for any of my wedding clients. As I imagined and very carefully thought about some of the images I would create during the wedding, the spectacular oak tree always came back to my mind. How would any of my wedding clients want to remember getting married at Legend Oaks Golf & Tennis Club. What would they expect from a master wedding photographer and a lighting expert like me to create for them? Well, I waited until later toward the reception and politely asked the two brides to give me 8 minutes of their precious time. There I had already set up my trick lighting equipment, yes 8 minutes and 3.5 hours of post editing later, I end up with one of my best most compelling with a very artistic style wedding image. The reward of loving your craft and having a huge passion for wedding photography. Keywords: Charleston (1179), Charleston weddings (3), Legend Oaks Golf andTennis Club (3), Michel Berda (1140), photographer (1125), Wedding (90), Wedding Photographer (1254), Wedding Photographer Legend Oaks Golf and Tennis Club (3), Weddings Legend Oaks Golf and Tennis Club (3).